Since the proposal to build the VHL Traditional Medicine and Complementary Therapies (TM&C VHL) was presented in Nicaragua, in the beginning of 2017, during the meeting “Advancing towards Universal Health: contributions of Traditional and Complementary Medicine”, many important steps have been taken to expand collaboration and development of the TM&C VHL. In fact, the enthusiasm of the TM&C Regional Network, which has representatives of organizations from several countries, as well as the leadership of PAHO/WHO Health Services Unit, and the technical cooperation of BIREME, have been the facilitating elements for the fast development of this VHL. The TM&C Network organizes and distributes responsibilities and activities among the working groups. The TM&C VHL was also presented in the I Congresso Brasileiro de Práticas Integrativas e Complementares (CONGREPICS), held in Natal, RN, Brazil, in October 2017. The project drew attention of the representatives of the Brazilian Ministry of Health, who manifested their intention to allocate resource to strengthen the Network and to build the Academic Consortium, designed to drive research on integrative health. This fact paved the way for a specific meeting, during the TM&C International Conference, in March 2018. The project was presented to Dr. Stéphanie Espinosa, consultant for Traditional, Complementary and Integrative Medicine at the WHO, who stated at the end of the meeting: “This project is very interesting and very important!” One line of action that drew her attention was the establishment of a TM&C database, by means of mapping and registry of the literature on these subjects, published by the Latin American Region, including the gray literature. She perceived the possibility of escalating the database from regional to global level, while a similar initiative was discussed in India and China, and supported by the WHO. The activities of this line of action have already started and include the collaboration of information professionals from Peru, Colombia, Brazil and Chile. 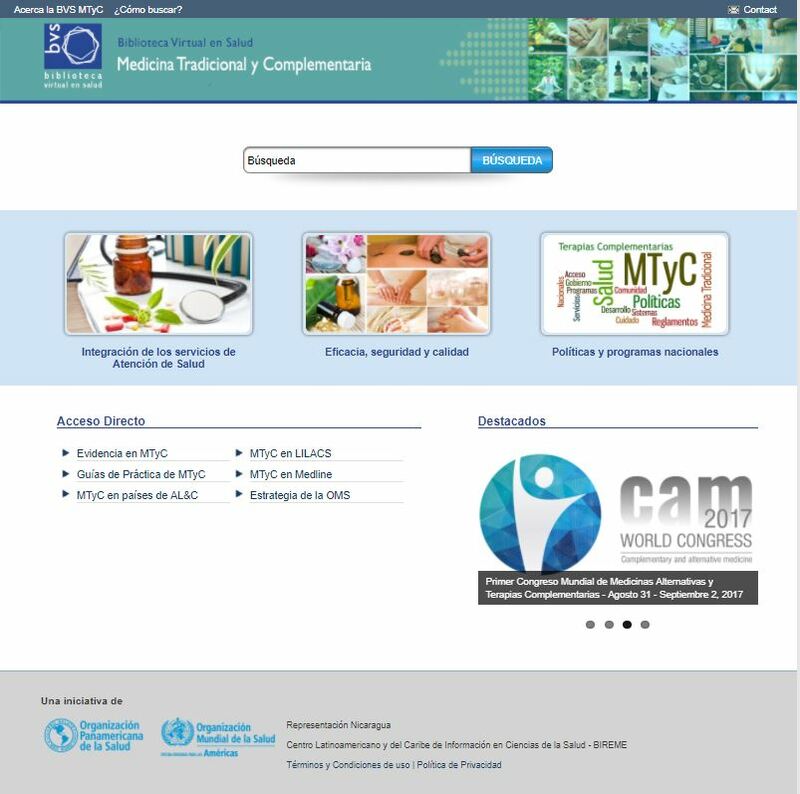 The TM&C VHL aims to promote visibility, access, use and generation of scientific, technical and educational contents, which contribute to actions that support, develop and integrate the TM&C VHL with health services and systems in Latin America and the Caribbean. The project results from a cooperation agreement between BIREME and the PAHO/WHO Office in Nicaragua, which received funds from the inter-programmatic project held with the Canadian government – Integrated Health Systems in Latin America and the Caribbean. In addition, the Brazilian government will provide funds, as mentioned above. The thematic structure under discussion, which will be applied in classification and organization of the TM&C VHL contents. Besides the information products and services, the VHL will have national subportals to present how each country of the region works. This space is important to strengthen the existing national networks and to allow countries to share their experiences.